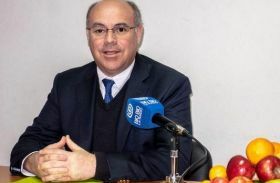 Jorge Valenzuela has been appointed as new president of Chilean fruit producer federation Fedefruta. Valenzuela, who is also executive director of Nueva Vid, a nursery in the O’Higgins Region, and owner of walnut producer Natividad, previously held the role as vice president of the organisation for four years. He takes over the position from Luis Schmidt, who resigned following his recent appointment as Chilean ambassador to China by President Sebastián Piñera. During a press conference announcing the new appointment, Schmidt said he anticipated a strong performance for Chilean fruit exports during 2018, in spite of the looming trade war between the US against China. The producer association is forecasting shipments of 2.814m tonnes worth around US$5.372bn, and increase of 6.1 per cent in volume and 7.4 per cent in value with respect to last year. Luis Schmidt, former president of Fedefruta and current Chilean Ambassador to China, pointed out that although this was still a projection, and the crucial spring months had yet to pass, the rise was good news for Chile. “If these forecasts are met, then once again the fruit sector will consolidate its position as Chile’s largest agricultural exporter, accounting for 41 per cent of total exports,” he said. Cherries were among the top performers, with exports growing by 108 per cent to top 170,000 tonnes. Blueberry exports also increased 30.5 per cent to more than 115,000 tonnes. However, avocado exports were projected to fall 11.4 per cent to 157,000 tonnes, while pears were down 10.9 per cent at 135,000 tonnes. Notwithstanding the positive projections for the current year, concerns over the trade war between the US and China are mounting. Schmidt said that "fortunately, fruit exports are protected thanks to two factors: the enormous diversity of markets that we have, and the battery of trade agreements Chile has signed, that currently number more than 27”.